end Kernel panic - not syncing: No working init found. Try passing init= option to kernel. See Linux Documentation/admin-guide/init.rst for guidance. I have some experience with programming languages like C and C++, and the Linux command line. I know the basic commands and utilities like man, cat, ls, vim, g++. However, I know little about IT itself or system calls and operating system internals. So these error messages are mostly cryptic for me. 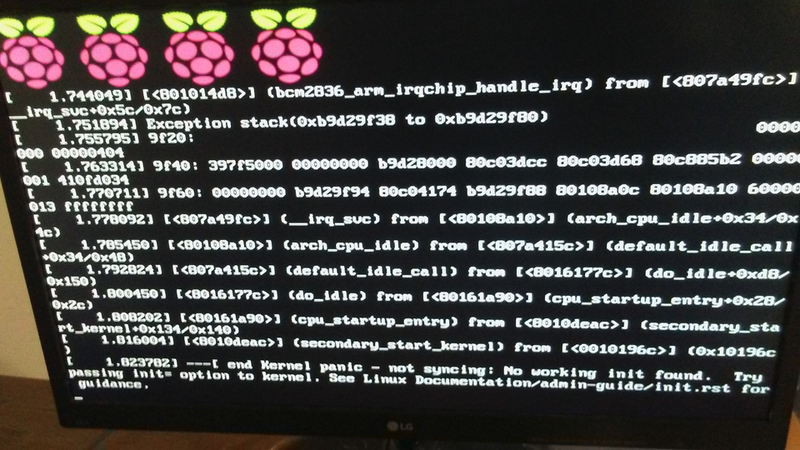 Please explain to me, why under normal operations in ordinary circumstances, the Raspberry Pi would suddenly fail with a Kernel Panic? It’s possible the card has gone up the creak and been corrupted some how. Did you pull the power or have a power cut at all without powering down the Pi? Had you deleted any files at all? How old and what type was the card? Simplest fix is an OS re-install but you could try a few of these fixes https://raspberrypi.stackexchange.com/q ... ound#41977 if you have another system or need something off the card. If you are looking at a reload then do not bother with NOOBS - it’s quicker to download Etcher from here https://www.balena.io/etcher/ and install Raspian direct from the downloads page here https://www.raspberrypi.org/downloads/raspbian/. No need to unzip - Etcher will read this file directly. I think that the power connection to the Raspberry Pi was lost while the OS was running. That could actually have been the source of the problem. Can an interrupted power supply cause the SD card to get screwed? I have not deleted any files that are part in the system directories. This was a brand-new SD card that I got from the store. I do recall that right before the kernel panics started, the power supply to the machine was interrupted. Next time when I install the Raspbian OS and user programs onto the SD card of my Raspberry Pi, how can I clone it into a new SD card in case of a subsequent power failure? Are there some tools to automate this process? Is it sufficient enough to simply copy and paste all files from one SD card onto another? Windows users could use this way https://lifehacker.com/how-to-clone-you ... 1261113524 - as I’m Mac and Linux I’ve not tried it though. The majority of Linux config files are flat / text files and config files are often documented well - it’s normally possible to get a copy of the files and keep them separate for rebuilds - document, document, document, backup frequently and often are my hints.